NEWS: Sept 2009 - Congratulations to Will Short whose Woodpark Diamond by Rumsden Tsar secured his first ever Fintona NI National Charolais Show Champion. Diamond topped a strong class, and then was placed Intermediate Male and Supreme Male Champion at 12 months old on his first outing. 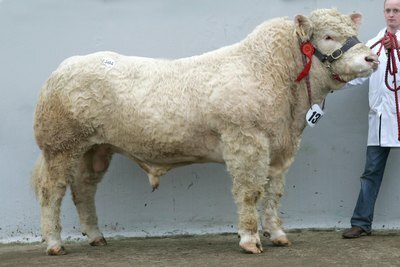 NEWS: At Perth in Oct 2008 Tsar sons sell up to 7,000gns. NEWS: At Perth in FEB 2008 Woodpark Bishop by Tsar sold for the day's second top price of 13,000gns to pedigree breeder David Stobart of Cumbria. NEWS: Tsar's second son in Perth sold for 11,000gns to pedigree breeder Terry Coghill of Orkney. Tsar was the second calf of Oolala, whose first was Rumsden Samurai sold for 14,000gns. 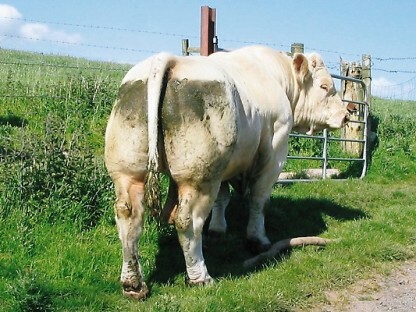 Tsar was always an exceptionally muscly calf, and was sold privately to a pedigree breeder, Will Shortt, of Omagh, N. Ireland. Tsar was Reserve Charolais Champion at Kent Show.